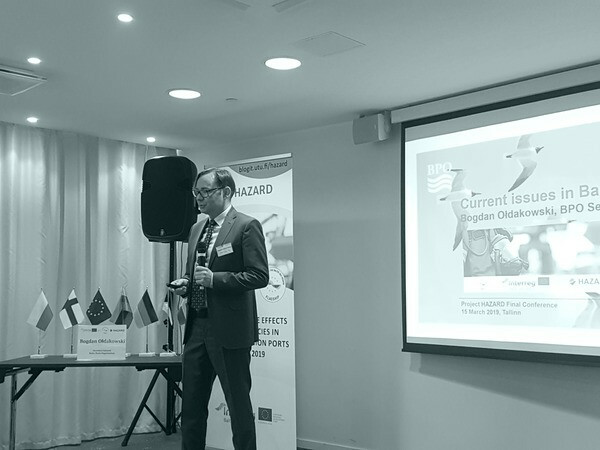 The HAZARD Final Conference took place on 14-15 March 2019, in Tallinn, Estonia. The event featured a number of speakers from high-level institutions touching upon various safety, security and risk management issues relevant to the Baltic Sea region (BSR). The Baltic Ports Organization was present at the event, sharing with the audience the current issues surrounding the development of seaports in the BSR. As one of the project’s associated organizations, the Baltic Ports Organization (BPO) greatly values the task the project leaders took upon them. Ports and cities existing side by side and the challenge of making this coexistence as smooth as possible is one of the issues gaining increasingly more importance on a seemingly daily basis. HAZARD addresses one of the more important aspects of said coexistence – security. These days, due to expansion from both the side of ports and cities, ports, terminals and storage facilities are often located close to residential areas. This greatly increases the possible extent of consequences in case of an accident. The types of safety and security emergency include, for example, leakages of hazardous materials, fires on passenger ships at port, oil spills in port areas as well as explosions of gases or chemicals. "There is a whole unique culture of cooperation among the Baltic ports and stakeholders making up the maritime community in the region. Baltic ports have worked together in several areas including environmental management, deployment of facilities for LNG bunkering and establishing common objectives in order to strengthen their position within the TEN-T policy. The outcomes of the HAZARD project prove that a lot can be achieved by proper cooperation between parties forming the port ecosystem. Security should always be the number one priority and by working together, thus improving communication and overall preparedness, risks can be successfully minimized”. The HAZARD project improves upon a number of areas, including the harmonization and implementation of safety and security codes, standards and regulations, the transparency towards the public, as well as better use of risk analysis methods and the adoption of new technologies. The event also saw the presentation of the “Foresight Study on Transport and Logistics in the Baltic Sea Region by 2030”, aimed at mapping the transport and logistics outlook of the BSR until the year 2030 by surveying a carefully selected and authoritative expert panel from the entire region. The study, part of the HAZARD publication series, was conducted by Eeli Friman of Turku School of Economics. “The HAZARD project has provided a rather unique transnational learning platform, where logistics operators, rescue services and other civil protection authorities, as well as other stakeholders together with knowledge partners around the Baltic Sea Region, have evaluated and improved the procedures and practices in emergencies. During the HAZARD project, together 10 joint large-scale exercises were executed in Finland, Lithuania, and Germany. HAZARD has also helped the project partners and their peers to better understand and apply risk analysis and assessment methods in mitigating accident risks in seaports”. The project runs for 36 months, from spring 2016 to spring 2019 and is approaching the end of its implementation period on April 30, 2019. The total budget of EUR 4.3 M was partly funded by the EU’s Interreg Baltic Sea Region Programme. More information about the project and the aforementioned study can be found on the project’s website.